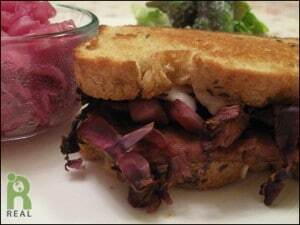 The Tempeh Reuben has become a popular sandwich in vegan circles. Our REAL version features smoke-flavored tempeh with our REAL Caraway Seed Rye-Style Gluten-Free Bread and Vegan Mozzarella from Miyoko Schinner’s Artisan Vegan Cheese Cookbook. Cut the slab of tempeh in half and then filet each half so you are left with four pieces of tempeh about a 3/8 inch thick by 3.5 inches long by 2 3/4 inches wide. Rub the tempeh with the olive oil, minced garlic, salt, pepper, and caraway seeds. Place the tempeh in a glass Pyrex baking dish. Sprinkle the tempeh with the tamari, syrup and/or sugar. Sprinkle the tempeh with the chopped onions and the shredded cabbage. In a separate bowl combine the tea, vinegar and liquid smoke; mix well and pour over the tempeh/cabbage/onion. Cover the baking dish with parchment paper and then with aluminum foil to make a tight seal. Place in the oven and bake for one hour. Remove the foil and bake for an additional 30 minutes or until the liquid has reduced by half. Remove the tempeh then mix the cabbage and onion mixture with the remaining pan juices, making the sauerkraut. Take the 8 slices of bread and spread one side of each slice with vegan butter. Place on a sheet pan buttered side down. Lay a slab of tempeh on four of the slices; lay the cheese on the other four slices; take a quarter cup of the sauerkraut and place on tempeh. Place the sheet pan in the hot oven and bake the sandwiches for 10 minutes or until the cheese is bubbling. Remove from the oven. With a spatula carefully place each cheese half on the tempeh sauerkraut half. Plate with mustard, the remaining sauerkraut and a salad. Serves four hungry adults or cut each sandwich in half and serve 8 appetizer size portions.